No matter how many signs New York Rangers management has given out since February that it was serious about a patient, full-blown rebuild, the organization’s DNA left at least a segment of fans and pundits unconvinced that the concept might be little more than cosmetic. A measured offseason in which the Blueshirts’ focus on the long game was unmistakeable, though, should finally leave no doubt that the club is going to try and do this right. There was no draft-day trade madness using their haul of picks and no impulsive dives into the deep end of the free-agent pool this summer. No, it should now be clear to all that the coming seasons will be precisely what general manager Jeff Gorton and the front office announced in a letter to season-ticket holders in early February: A methodical and focused build from the foundation upward, the ultimate goal being a sustainable contender not unlike the one that just finished running its course last season after a decade of near-perennial playoff appearances. The Rangers insisted then that a trade deadline sell-off was coming, and it certainly did in the form of Ryan McDonagh, Rick Nash, J.T. Miller and Michael Grabner heading out the door in return for draft picks and prospects. 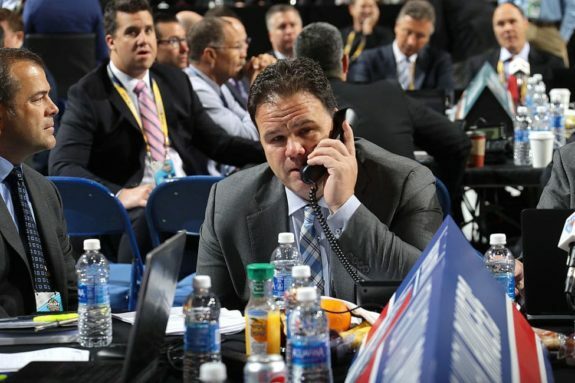 After that, amidst sometimes wild speculation that insisted Gorton would package some of his resulting 10 picks in the draft for Erik Karlsson or another quick-fix veteran acquisition, the Rangers simply went ahead and made those selections. Their only trade happened when they sent one of their two second-rounders to the Ottawa Senators to move up four spots and select defenseman K’Andre Miller 22nd overall. Gorton’s prudence continued after July 1, with the only long-term deal handed out being the six-year, $31.5-million pact for 24-year-old defenseman Brady Skjei, who the Rangers view as a soon-to-be cornerstone. Otherwise it was two years and $8 million to Vlad Namestnikov, a two-year, $4.55-million bridge for the promising but very raw Jimmy Vesey and two years and $8 million for versatile depth forward Ryan Spooner – all fellow restricted free agents. 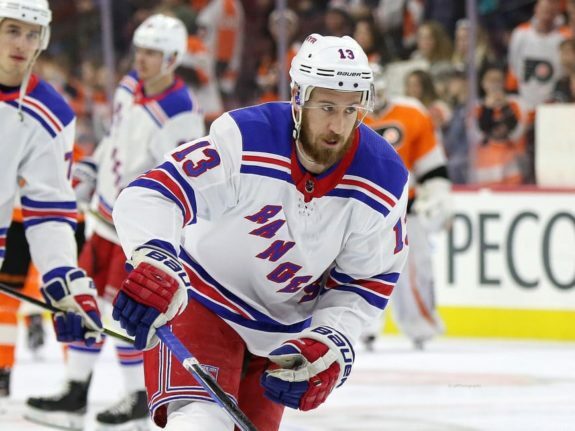 Perhaps the most carefully thought-out decision, though, was the arbitration-avoiding one-year, $5.125-million contract for Kevin Hayes, who might prove to be part of the long-term future but who just hasn’t been exceptional enough in his four NHL seasons for the Rangers to commit serious years and money—at least not yet. Contrary to media speculation, free agent John Tavares was never in play, with the Rangers never showing any signs that they were willing to enter bidding for the now-former New York Islanders star. Oh yeah, and there’s also that coaching hire, with the successful pursuit of Boston University’s David Quinn being another crystal-clear signal that player development will be the philosophy for the foreseeable future. File the front office’s approach so far in the win column. Keeping the eyes on asset acquisition and development, while resisting the impatient urge to bring an aging star to Broadway this offseason—something the club hasn’t often been able to do in the past—might be looked back upon as a critical period in team history. No doubt Gorton is aware that full tear-downs and gradual rebuilds hardly guarantee a playoff contender at the end; for too many teams, such an “end” never seems to come into view. Management, though, saw little choice but to do it, and the decisions of the past six months have certainly been made in the interest of the club’s long-term health. Gorton didn’t see any shortcuts back to contention with his thinned-out, aging roster, and he wasn’t interested in looking for them. For now at least, the faithful will have to be buoyed by the enthusiasm of one of the few players sure to be here for the long haul. Without the pressure to win immediately that comes from a high-profile veteran having been added to the roster, the Blueshirts have the flexibility to go where the rebuild takes them in 2018-19. Spots are there for the taking by the youngsters up front and on defense. 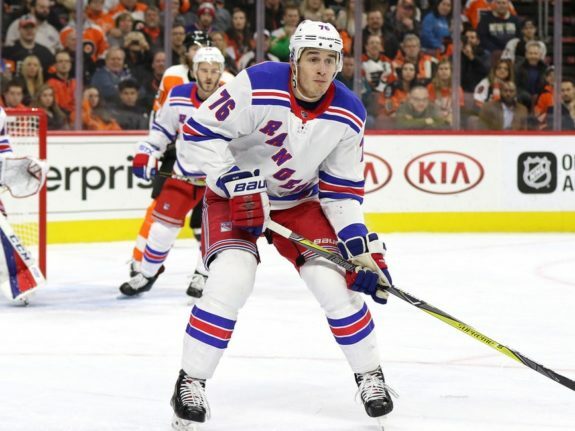 At the same time, if Hayes, Namestnikov and Vesey—none over the age of 26—clearly establish themselves as more than transitional players this season, the Rangers can look to sign them to longer-term contracts in the coming years. In the case of Hayes, the club has the option to pursue such an agreement during the upcoming season or move him at the deadline for more futures should it so choose—presumably opening up another spot for the organization’s gaggle of young centers to seize. So maybe Skjei is right—there’s plenty for Rangers fans to be excited about. They just might need to temper that enthusiasm with a dash of patience and perspective—two traits not often associated with New York sports fandom.